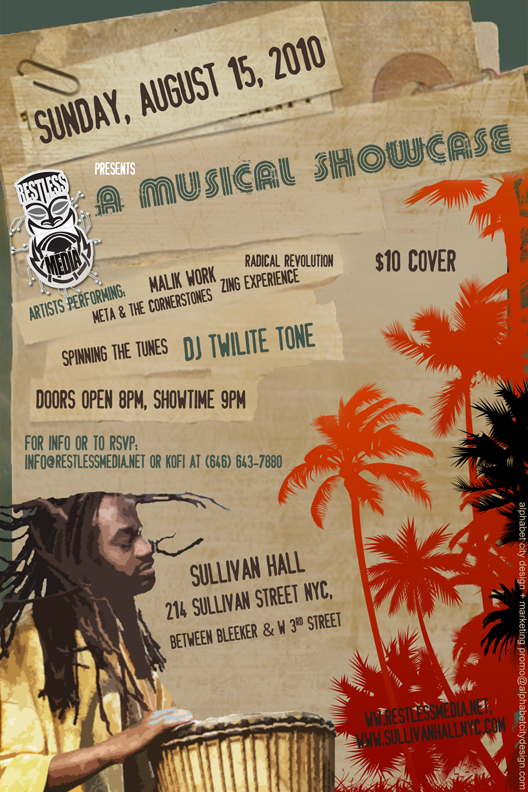 My partners and I host a regular Sunday event at Sullivan Hall in Manhattan called Restless Media Presents. Last night was the third in a series of live musical events under our Restless Media Presents banner. The first event, Restless Media Presents: A Musical Showcase, was the inaugural showcase, featuring Meta & The Cornerstones, Malik Work, Radical Revolution and Zing Experience. Thanks to Raquel from Alphabet City Design for this hot flyer! This was our most successful event, with loads of people. Each of the bands brought a nice crowd with them, and complimented our promotional efforts with their own. The next event featured Boukman Eksperyans, along with Zing Experience and the Brown Rice Family. 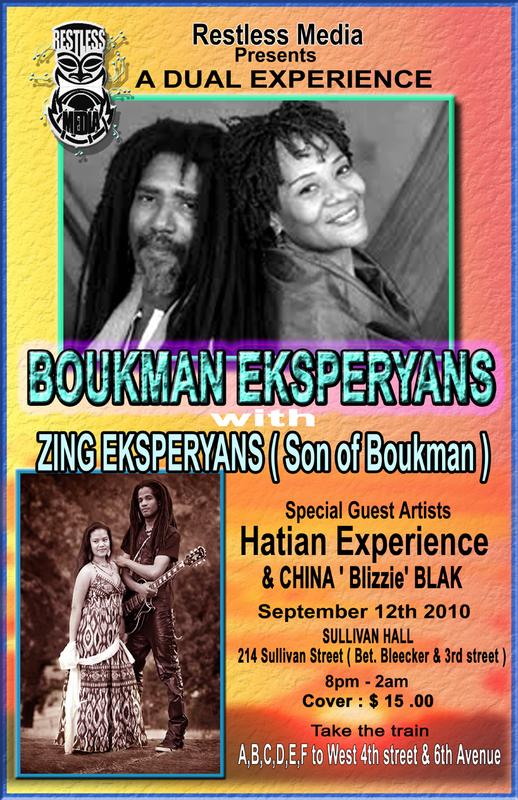 Dubbed, Restless Media Presents: A Dual Experience (due to the fact that Boukman and Zing are father and son), it was a night of Haitian reggae. Despite the huge popularity of the main act (at least among Haitians), the turnout was…how do you say…ABYSMAL! and the bands played to a really sparse crowd. Despite our promotional efforts, the bands themselves engaged in little (to no) promotion, and it showed. Our most recent event, Restless Media Presents: Derrick Barnett & The Statement Band, with special guests, Marcia Davis & Outro, and featuring Stephen Souza, Devon Jorge, Ed Robinson, Scepta, Jr Dread and Alrica, was a veritable reggae concert, with artists doing collaborations all night long. Shout out to Jeffrey Garibaldi for the artwork and flyer. With the line-up, I just knew we’d pack the house. We set up a Facebook event page, and the artists generally promoted the night. But, once again, the crowd was particularly thin, considering the line-up and venue. What I’ve learned is that you can’t take promotion for granted. Despite the appeal of the band or venue hosting the event, you’ve got to go hard or go home when it comes to making your event a success. The difference in the three events we’ve hosted is that the bands on the first night were generally young cats. They were all trying to make a name for themselves, and bought into the whole concept of self-promotion. Even though we were promoting the events, they knew that no one had more pull with their audiences, than they did. And they promoted the show accordingly. Unlike the acts from our first show, their promotional efforts were tepid at best, and they simply didn’t seem to exude the same energy and excitement of the younger bands. 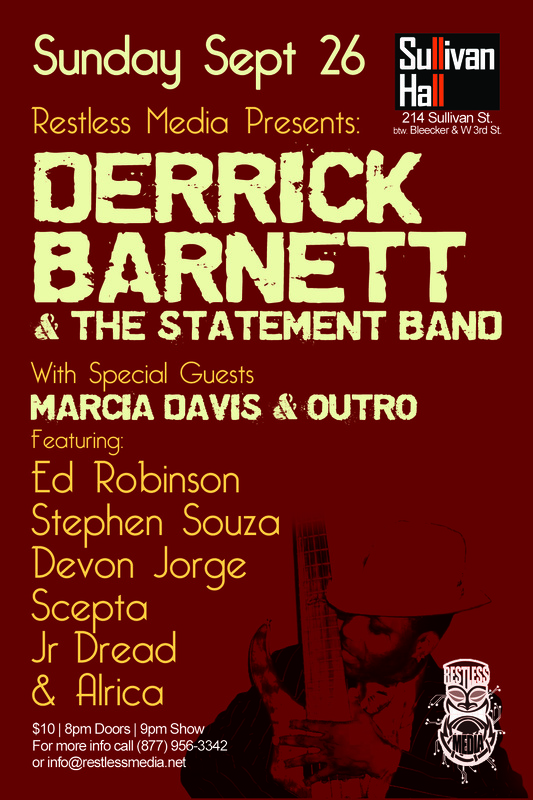 There were also other events going on both nights (Israel Vibration at BB Kings on the night of the Dual Experience and a slew of reggae events in Brooklyn on Derrick Barnett’s night). So it’s possible the small crowds were attributable to other sources – but not likely. Anyway, we’re going back to the drawing board with our event. We’ve got a date on Halloween, Restless Media Presents: Halloween Havoc, featuring The Real Live Show. We’re bringing on a proper promoter for the night, and starting our promotions dumb early (I’m tired of listening to bands play for crickets).